There are bearings and then there are BNL bearings. We specialize in custom bearings designed to meet requirements for quality and performance and bring added-value to the final product. We work with you to meet your objectives. Whether it is improved product life, operational efficiency, market-leading innovation or added value. We combine required functions into our plastic bearing design, providing an effective solution while minimizing the components and operations needed to produce it. By enhancing value in the design, we can reduce costs while increasing performance, quality, innovation and competitiveness. By using innovative molding techniques and integrated design expertise, BNL can reduce the component count of the final product. Our light weight materials coupled with integrated designs, reduce component count and can decrease weight to less than 40% of an equivalent metal bearing solution. Features can be designed and molded into the bearing component itself, eliminating whole assembly stages. With a torque to rotate of less than a third of that of a metal bearing, our bearings will realize operational efficiency with the use of lower specification motors and less energy consumption on start-up and in operation. Plastic is inherently lubricated, so there is no need for greases and oils that can contaminate processed products and leach out during operation. Integrated fixtures and features allow the bearing component to be easily assembled or disassembled into the final product. 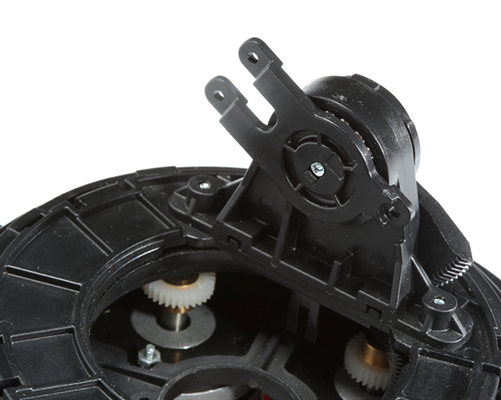 Our specialized plastic molding techniques produce a more durable bearing surface, significantly improving wear resistance and increasing the life of our products. Capable of handling most chemicals that can corrode mechanisms and reduce performance or where there is water and moisture during operation. Completely metal free options make BNL bearings ideal for applications where metal can distort magnetic resonance.